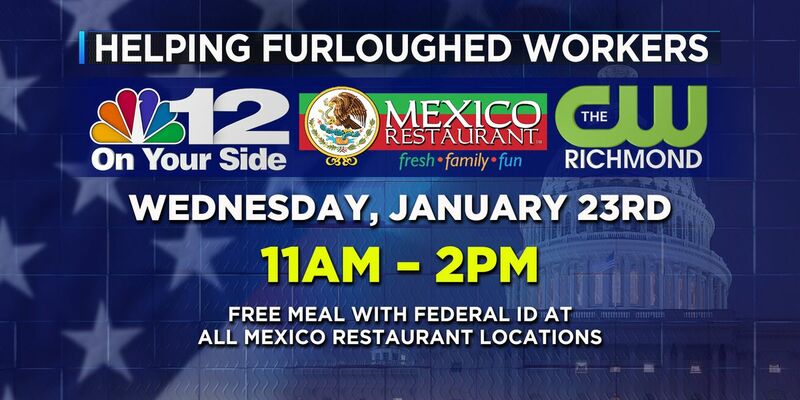 RICHMOND, VA (WWBT) - NBC12 and CW Richmond are teaming up with Mexico Restaurant during the government shutdown to help furloughed federal workers. On Wednesday, Jan. 23, the restaurant will provide free meals to any federal employee who is currently furloughed. Customers must provide proof with their federal ID. The event is taking place at all Mexico Restaurant locations from 11 a.m. to 2 p.m. Wednesday. See full list of locations here.